Cats are notorious for their love of comfort and coziness. Any cat lover will know that they can find their feline-friend in the most snugly spot in house. Maybe they’re curling up on a windowsill and catching those last sunny rays, or perhaps they’ve found a comfortable little corner next to your heater and enjoy basking in its warm delights. A heated cat bed is the perfect way to treat your fury-friend and will offer them maximum comfort and warmth all year long. Heated beds are perfect for cold climates and will keep them super comfortable no matter the weather. They are also a great pick if you have elderly, or arthritic cats who need some extra comfort and warmth. Warm beds will soothe their joints and offer them extra comfort and ease. Heated beds come in a variety of styles and options and the main thing you need to think about is whether you want a model that utilizes electricity, or one that simply uses self-heating materials. Whatever your preference, you’ll find the perfect heated cat bed on our list for you and your paw-some pal. As always, our top picks boast an array of products to suit all budgets and design tastes. The first pick on our fabulous list of heated cat beds is an amazing self-warming bed by Aspen. This gorgeous product embodies total comfort and style and is definitely a model that won’t break the bank. This round bed has been designed using heat reflecting technology this special pick reflects your cat’s body heat to ensure extra coziness and warmth. This model is lightweight and portable and thus a great option to take on holiday or move around the house as needed. This bed is also great if you have a feline friend who likes to burrow, and the plush edges will make them feel extra secure. Depending on your style preferences, this heated bed comes in barn red, navy, cream, or brown and thus there is the perfect option to suit your home. This item can be easily hand-washed when needed and thus can be kept clean at all times. This is a non-electric model and is therefore also perfect for days when you aren’t at home, and your kitty wants to stay snuggly and warm. 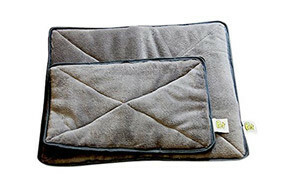 Up next on our list is a beautiful and snuggle-tastic pick from K & H Pet Products. This Thermo-Kitty heated cat bed is an awesome all-season model and boasts amazing quality and style. In colder months you can turn the heater on for ultimate cozy bliss, and when it gets warmer you can remove it. Thus, this bed is suited for any weather and come rain or shine it will keep your baby super comfortable. The ortho-foam wall ensures maximum comfort and allows your cat to burrow in and get extra snugly. This is especially helpful if you have an elderly cat who is struggling with joint problems and needs extra comfort. The cover is also removeable and you can quickly unzip it and wash it in the machine when needed. A thermostat 4-watt heater is able to warm the bed up to 15 degrees warmer than the air temperature and uses minimum energy for extra savings. This is truly a fantastic pick for any cat lover and is bound to make your precious pal feel super safe and warm. This next pick is an absolutely gorgeous heated cat bed and this deluxe model will suit those stylish felines in your life. This leopard print cave-style bed with a zip hood takes comfort to the next level and will envelope your cat in all its snugly glory. The removeable heater only utilizes 4-watts of electricity and thus won’t put strain on your electric bill. The dual thermostat warms the surface of the bed 10-15 degrees above the air temperature and will keep your pet warm all winter long. This model is also a breeze to clean. You simply out the heater and the foam from the removeable covers and throw the cover in the washing machine. But remember not to wash the heater or the foam walls! This model also comes with a stunning leopard print interior and is definitely suited to all those feisty felines in your life! This make amalgamates top quality, with beautiful style and definitely won’t let you down. 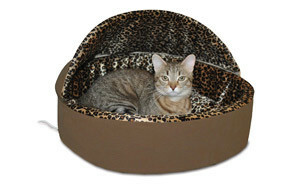 Number five on our list is an absolutely gorges heated cat bed by Best Friends by Sheri. This lovely dish shaped model will cocoon your cat in its fluffy bliss and envelope them in its cozy comfort. 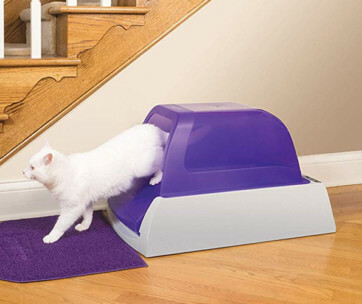 The 12-inch back wall offers them extra back support and is a great choice for elderly pets who need some extra help. 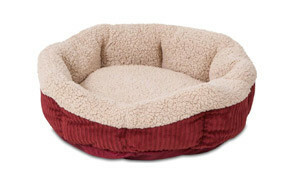 This top-quality self-warming cat bed is constructed with flexible Sherpa fabric and allows for lots of flexibility and movement. Warm pet beds are a brilliant choice for pets with joint pains and this will give them extra love and care. This fabric almost mimics their mother’s fur and will leave them feeling truly comforted and safe. This model also has a water and dirt resistant bottom to ensure this product remains net and clean. Washing is also super easy as you can just pop the washing machine and vacuum the interior. This truly is an awesome pick and won’t let you or your best friend down. K & H really know how to balance quality with great value, and this next pick on our list certainly won’t disappoint. This Thermo-Kitty Heated pad is a wonderful pick for those chilly winter months and is sure to keep your feline friend super comfy and warm all season long. This electric bed is controlled with an internal thermostat that is able to regulate the temperature and respond to your pet’s body heat. It only uses 4 -watts of electricity and thus won’t drain your electricity bill. Coupled with this amazing technology, is orthopaedic foam to ensure maximum comfort, especially for elderly pets who need some extra support. The thick plush bolster offers extra security and will keep your cat feeling protected and safe. This cat bed boasts ultimate safety and has been tested by MET labs to adhere to electrical safety standards. Depending on your style, you can opt for a blue or mocha color and thus, this model will suit various interiors and style preferences. Lucky number 7 on our list is a seriously stylish and luxurious design by Aleko. This thermo pad heated cat bed is the perfect pick for those looking for a top-quality heated cat bed. This gorgeous model has an in-built electric heating element that will keep your pet snugly all winter long. This is truly perfect if you live somewhere that’s prone to extremely cold weather conditions. The bed is powered by a 6-foot long cord with heavy-duty chew resistant lining. 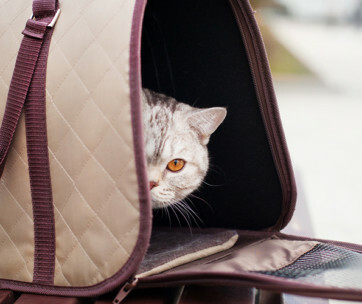 Thus, you will be able to feel secure when your pet is in their heated bed and not have to worry about them chewing through the electric cord. Thanks to its internal thermostat this amazing bed also won’t over-heat and will ensure that your beloved pet is always totally comfortable and happy. This fabulous self-warming cat bed is lined with super soft fabric and the pillow is stuffed with extra padding for maximum luxury. The bottom also boasts water resistant, non-skid material and thus you can put this bed on any surface without having to worry. 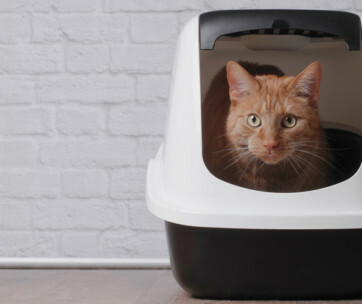 This model boasts amazing quality and style and won’t let you or your beloved cat down. Last but not least on our fantastic list of heated cat beds, is a gorgeous and super affordable pick from Downtown Pet Supply. This cute bed comes in a choice of four different prints and each pat contains a layer of specialized self-heating material known as mylar film to ensure that your cat stays super snugly and warm. 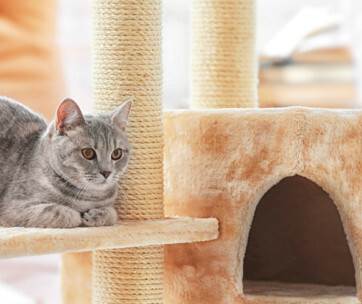 The plush pad top makes this a really comfortable choice and no matter where you pop it in your home, your cat will be sure to have a super comfortable rest. It’s also super easy to maintain and you can simply pop the bed in the machine on a cold wash when it needs a clean. To dry it, you simply hang it up on the line. This pick amalgamates awesome user ease with quality and great value and is thus a great choice for any pet lover. The funky prints are also great if you’re into style and these prints will certainly bring some fun into the home. There are a few things you will need to think about when you decide to buy a heated cat bed for your fury-friend. What type of heater you want: An electric, or non-electric model? Some beds come with an internal electric heater that can be switched on and utilizes electricity, while others simply use heat reflecting technology to trap the cat’s body heat and keep them snugly and warm. An electrical heater will usually get warmer and is great for really cold temperatures, however, if you are out the house a lot and feel uncomfortable leaving a heated bed on while you’re out, a non-electrical model is a better choice. Once you have decided what type of heater you want, you need to think about the style of bed. Do you want a rectangular flat bed that you can simply fold up when not in use? Do you want a cocoon style model that will envelope your kitty in all its snuggly delights? Or do you want a lovely plush round design? You know your cat best and you’ll know what model will have them purring in delight. You will also need to think about maintaining your cat bed and whether you want a model with a removeable cover that can be easily washed in the machine, or a cat bed that needs to be washed by hand. Keeping your cat warm amid even the coldest of weather conditions. They are perfect if you live in an area that experiences extreme cold. Making them feel secure no matter the weather. Supporting eldering cats, or those dealing with arthritis or joint problems. The warm heat will sooth aching joints and create extra comfort and security. Giving them extra comfort on cold, or stormy nights. Electrical heated pads that utilize electricity and need to be plugged in. These will utilize electricity but most function on a low wattage and won’t drain the bills. Self-heating material beds that don’t utilize electricity. These are great for pet owners who need to leave home frequently and don’t want to leave their plugs running. Q: What is a heated cat bed and how does it work? A: A heated cat bed is a super comfortable bed that comes with an internal heating system. This heating system makes the bed super cozy and warm and aims to ensure that your cat doesn’t get cold. They are a perfect pick for those who live in areas that are prone to extreme cold or for elderly cats, or kittens who might need some extra warmth all year long. Electrical models come with an in-built heater and require an electric plug point to work. Other models are designed with specialized self-heating materials that are able to respond to your pet’s body temperature and generate heat. 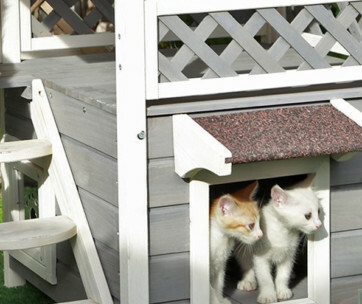 Heated cat beds are also a great idea if your pet struggles with joint issues or arthritis. The heat will offer extra comfort to aching joints and will stop the cold from making them feel aches and pain. If you have an elderly, or injured cat you might want to invest in an orthopaedic model that has been specifically crafted to support cats with medical issues. Q: Are heated cat beds safe? A: Like all electrical products, you have to be careful with electric powered cat beds and its advisable that you switch off the heater when you are not at home. However, they are perfectly safe when you are around and will offer your feline companion hours of snuggly fun. Many of the top-models come with specialized cords that have a chew resistant lining. If you have a pet who is prone to chewing things then this is essential to ensuring their safety. If you are often out of the house it is a great idea to invest in a non-electric model and save the electric one for those wonderful family evenings when you’re with your furry friends. Q: How do I wash a heated cat bed? A: Some heated cat beds come with a removeable cover that can be easily washed in your machine. These models are great and are super easy to keep sparkly and clean. Other models don’t have removeable covers but can easily be handwashed. Of course, you’ll have to make sure that you can remove the heater before washing your heated bed. Always check the manual that comes with your product and follow the particular instructions for your product. While we absolutely love all the items on our list and think they all offer your kitty epic snuggle opportunities, our favorite pick has to be the Aspen self-warming bed. This bed seriously combines amazing value with style and will keep your cat warm and cozy all winter long. Due to its self-heating technology, your fur-baby will never get cold and the anti-skid bottom makes this a really safe pick. Since it’s so lightweight it’s the perfect travel bed for those holiday adventures and will mean that you can always bring a bit of home with you wherever you go/ It also comes in an array of colors and is thus perfect for diverse design needs.